I’m ready for Winter to be over. Or at least ready for North Carolina’s weather system to make up its mind about which season we’re in. It’s currently a day by day decision. Over the course of the last two weeks, we’ve experienced snowstorms, freezing ice rain, wind storms, vaguely-named “wintery mixes,” and a torrential thunder and lightning storm that included a tornado watch. Smack dab in the middle of all that, we had a handful of perfectly-clear, sunny days with temperatures in the high-seventies. Maybe even eighty. Like it was nothing. Not that I’m complaining about those gorgeous, warm and breezy, summer-like days, but come on. We had back-to-back days with temperature swings of close to forty degrees. Ridiculous. My sense of eating seasonally is now completely thrown off. I’m suddenly craving all kinds of warm weather produce. Berries. Tomatoes. Corn. I’m about five seconds away from buying a pack of Chilean strawberries and declaring it Spring. Officially. 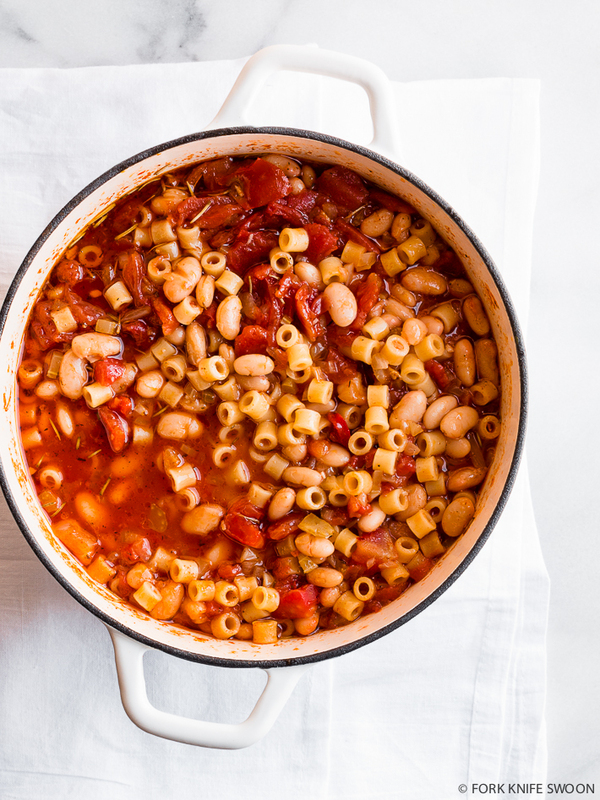 BUT, we’re expecting another wintery mix tomorrow, so I’m straddling the seasonal line for at least a little while longer, starting with this tomato and white bean stew. I’ve made several white bean stews and soups this winter; Lemony with dark, leafy greens. Spicy with shallots and bacon. Thick and chunky with hunks of chicken and caramelized butternut squash. 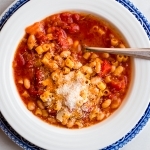 White beans are such a versatile, comforting base to build flavor upon. 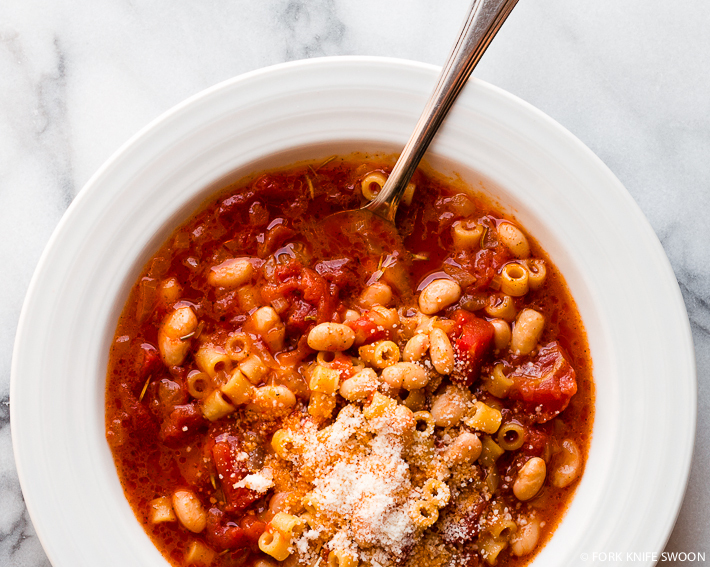 This version is all about a rich, herb-and-garlicky tomato sauce/stock that gets soaked up by the white beans and ditalini pasta. Then in turn, I sop up the stew with big hunks of crispy bread… Such. Goodness. This time of year, with the quality of fresh local tomatoes sorely lacking, I used canned tomatoes. 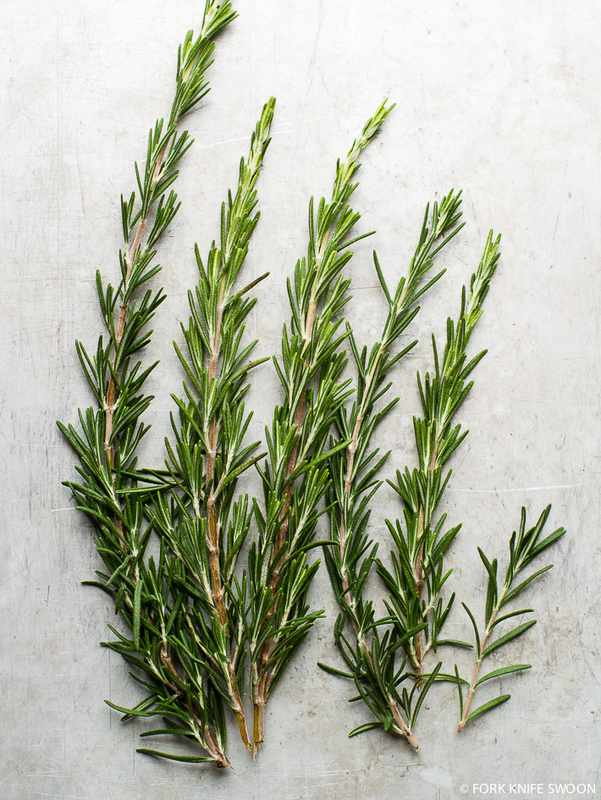 In a soup/stew like this, where I’m building layers of flavor with lots of herbs and spices, it’s an easy choice. During peak summer tomato season, you could of course substitute fresh tomatoes for an even more intense tomato flavor. Also important to note: this recipe easily shifts from stew to soup; simply adjust the amounts of liquid and pasta accordingly. 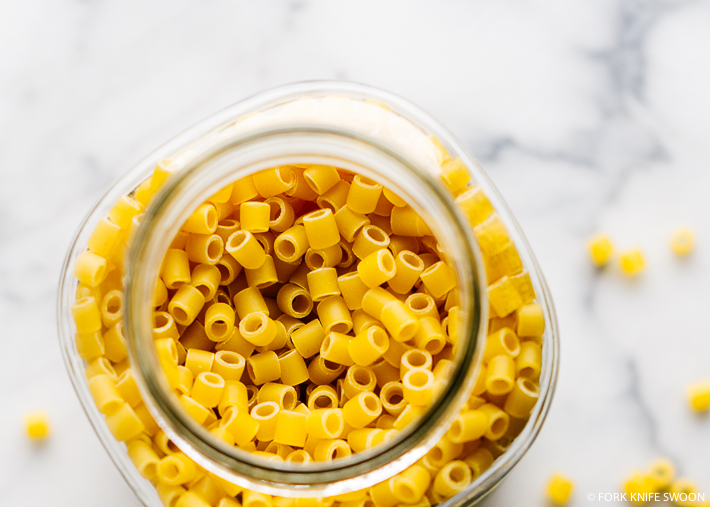 The sauce is quickly and easily absorbed by the ditalini pasta as it settles and coagulates, so if you plan to make a large batch for leftovers or simply make the dish in advance, I would err on the side of extra liquid. In a large, heavy-bottomed dutch oven or soup pot, heat the olive oil and butter over medium heat until melted. Add the onion, celery and garlic and cook until softened, about 2-3 minutes. Add the tomatoes and stir to combine. Season with the spices, then add the chicken stock, cover, and bring to a boil. When the stock reaches a boil, turn the stove down to medium heat. Add the pasta, and cook uncovered at a brisk simmer, stirring occasionally, until the pasta is cooked al dente, about 10 minutes. Add the white beans and cook until warmed through. Add additional salt and pepper, to taste. 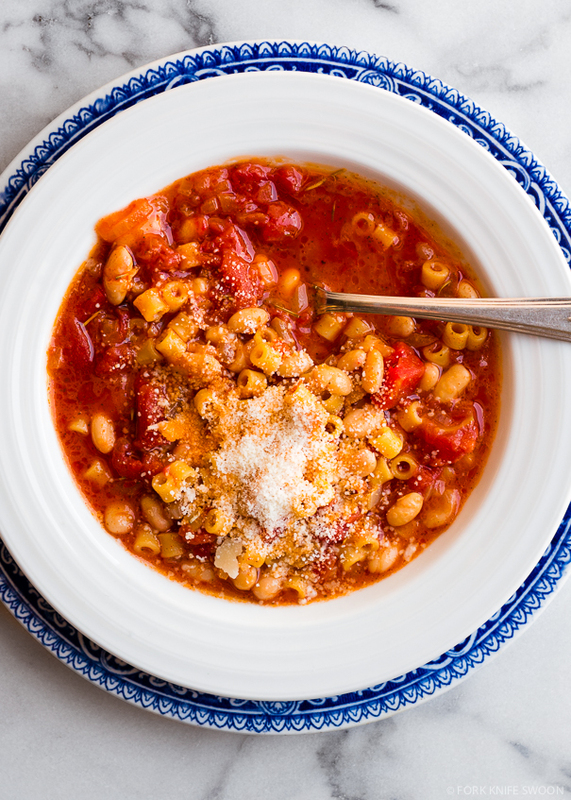 Serve warm with crispy bread and a dusting of Parmesan. Should you drain the white beans, or include the aquafaba? I know this is a post from last year but I had saved your recipe and made this soup this past weekend and it was great! Easy, flavorful and comforting. I want to kick this winter right the heck outta here. The snow is killing me. I miss outdoor life and running. 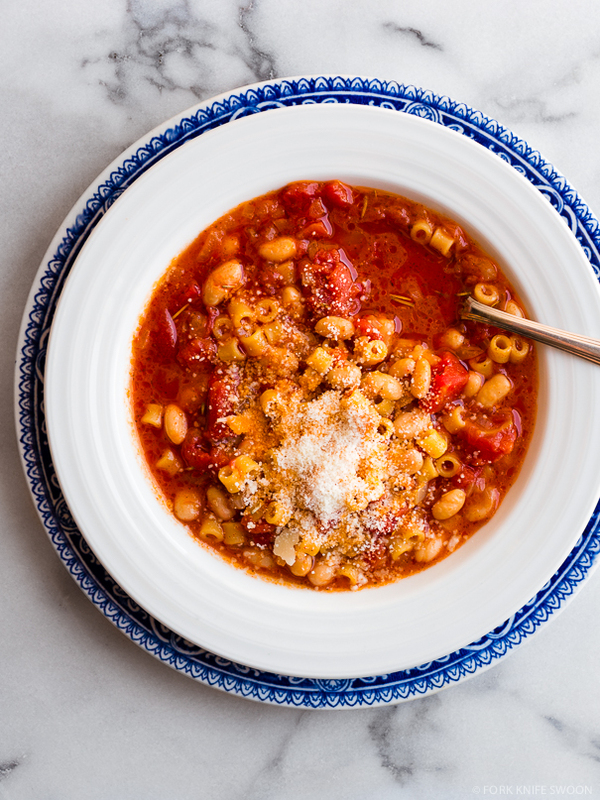 I’d say that this soup is perfect for a cold, blustery day. That stock sounds amazing. You have no idea how bad I wish I had this in front of my right now for lunch!! It looks amazing! Great recipe! I made it for dinner tonight and it was delicious. Thanks, Marnie! I’m so happy to hear you liked it! What a beautiful stew! Your pics are gorgeous too! just pinned. Thanks so much, Cheri! And thanks for the pin! What a stunning photo! This looks perfect for the cold weather we’re having here in Toronto. Wow Laura, what a beautiful looking dish! And you are so right with all this wacky weather!! We are getting it here up in NY too. We had a beautiful tease of Spring weather this past weekend… but now it’s back to freezing rain and snow. ::sigh:: This stew will totally warm us up though! I’m watching the snow fall, shivering from inside as I type. Saturday, I was basking in the warmth and enjoying the outdoors. What?! I’m with you, I wish the weather would just make up its mind. This soup looks like just the ticket for a surprise snow – warm and comforting. Isn’t it crazy?? I don’t know if I’ll ever get used to it! 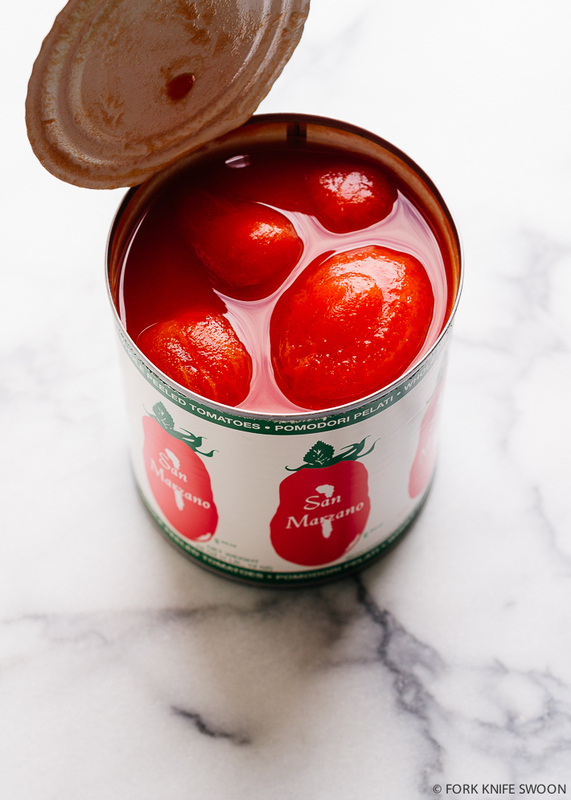 The photo of the tomatoes in the can took my breath away. Such gorgeous lighting. You’re so talented!